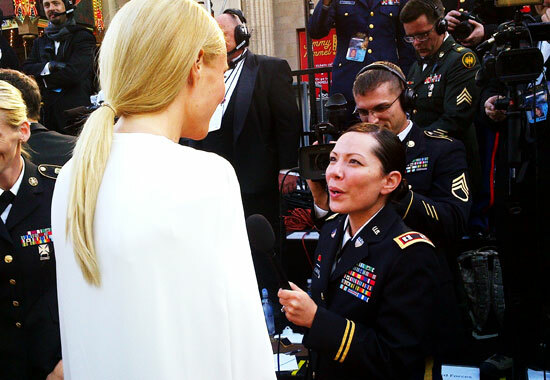 .com Darling: Gwyneth Paltrow Talks About The Tom Ford Oscar Dress With Stylist Elizabeth Saltzman & More! The following post is not written by me! It comes straight from one of my favorite .com Darlings, Gwyneth Paltrow, from her own site: goop! I read this on the train on the way home & happily rejoiced in my decision to sign up for goop’s super informative & fabulous newsletters. If you’re into style, healthy living, celebrity access, & lifestyle trends, then goop is definitely a site worth checking out. Do you really need me to endorse this? It’s Gwyneth-effing-Paltrow! Enjoy the read & Happy Styling! It’s always nerve-wracking to pick a dress for The Oscars, as it’s one of the (if not the) most scrutinized red carpets in the world. Getting the dress, the jewelry, the hair and the makeup requires a lot of work from stylists and designers who prepare months in advance for the event. Today we interview stylist Elizabeth Saltzman on her process and take a look behind the scenes at the prep for the big day. I’m lucky enough to work with stylist Elizabeth Saltzman who did an extra stellar job finding such a wonderful Oscar dress this year. Ordinarily, in preparation for an event, she’ll work with no more than four specific designers to gather several viable options for the event. This requires months of work, of phone calls, meetings, and many long conversations just for this particular evening. This year, she called me up and said there was only one dress and it’s true; this white gown, with its long white cape by Tom Ford was just right. Today, she’s kind enough to let goop pick her brain on how and why she chose this dress, and more generally how anyone can find the right look for any occasion. How did you come across this Tom Ford gown? A: After looking at what Gwyneth wore last year, I called each designer that I wanted to work with and looked at their sketches first. These are usually designs that they create specifically for The Oscars. This particular time, I went to meet with Tom Ford at his studio about a week before the event. Why did you pick this dress for Gwyneth to wear to this year’s Oscars? A:This dress screamed OSCARS to me. It simply was ‘the one’. The dress was composed of all the elements that I look out for for Gwyneth: supreme elegance, grace, royalty, extreme modern luxury, simplicity without lacking intense skill and risk. It had a positive edginess to it as well. Also, being such a fan of Jackie Kennedy through the years, I thought the dress channeled some of her iconic style, but this is my opinion. Can you tell us a little bit about the process of finding gowns for events like this one? A:It’s a long process that begins the moment when the nominees are announced and doesn’t end until the moment she steps onto the red carpet. The process consists of a lot of extremely late nights, when there are no phones ringing, no horns beeping, no children or husband needing attention. It’s the calm glow of a computer and lots of long-distance phone calls, discussions, FedEx’s to go through. First I call certain designers that I know I’d like to work with for the event and find out if they have something special that might work. I ask all the necessary questions… If they are dressing anyone else. If so, what color and style are the other people’s dresses?, etc. After that initial conversation, they send sketches, and I gently try to make tweaks that I know will work for my particular client. I generally work with two or three designers from the beginning until there’s a finished dress to try. We might Skype, email, and photos are often used so we can get a better idea of how the dress is taking shape. The best is if I can go see the dress in person, but I’m not always that lucky in terms of time or location. I always ask to see swatches (big ones) of the material – you never know… it might not show up well on a photo, it might be completely see-through, it might be rough to the touch or wrinkle prone. All of these need to be considered as it is my job to make sure there are no whooper mistakes on the evening. Once all is agreed, the dress is made. The next step is the first fitting. This is a moment of excitement, as you want your client to feel great and body language says it all. I look at the fit, we find the shoe that gives the right height and that is wearable for such a long evening. Fittings happen quickly, so I take tons of pictures from all angles so that I can take them home and digest. If I’m lucky, I get a second fitting in, to try the dress we’ve chosen with full accessories and get an idea about hair and makeup. On the day of, I’m there with the makeup artists, hair stylists, everyone, discussing every decision in minute detail, every step of the way. When she gets in the car, I make sure that the dress won’t get wrinkled on that long drive to the event. Are there politics involved in getting the right dress? A:Oh yes, the politics, especially when it comes to this event, can be rough if you don’t know the players. It’s hard because getting the right celebrity in the right dress can mean huge, and I mean monumental, publicity for a designer as well as the client. The advantage I have is that I’m not new in the industry and I’ve built relationships that are not about screwing anyone else over. It’s about being honest with the designers and the other people involved, listening to what they’re hoping for, and striking a compromise between their vision and the client’s needs. How much of your pick depends on what is simply a gorgeous gown versus the personality of and what will work specifically for your client? A:The client always comes before the gown. You have to think about the person, their body, their confidence, their coloring, their wishes, their needs and what will be successful for them. What advice would you give to anyone looking for the right dress? A:Think about what looks best on you, not which dress you like on the hanger. Think about your posture. Look at yourself in the mirror with how you would naturally stand, not in pose, as you’re usually not posing. Think about where you are going and how much you can relax knowing you are safely, securely, happily dressed. Once we had the dress decided on that week, everything else fell into place. Here’s a quick look into my day preparing for The Oscars and how we picked hair, makeup and jewelry to compliment my gown. I did an intensive cardio workout with Stacey McDermott from the Tracy Anderson Method and tried out my partner, Tracy Anderson’s new mini Trampoline workout for the Metamorphosis series. I get to the hotel for a shower and then get my roots done with Tracy Cunningham, who I always call when I’m in LA. She’s got my particular color down to a precise science. My kids come for a visit and we all go hang out at the pool for a little bit. I have my traditional pre-show turkey burger and fries before hair & makeup. Adir Abergel, who did my hair, initially goes for a tousled bun. We all decide that the dress requires even simpler hair. 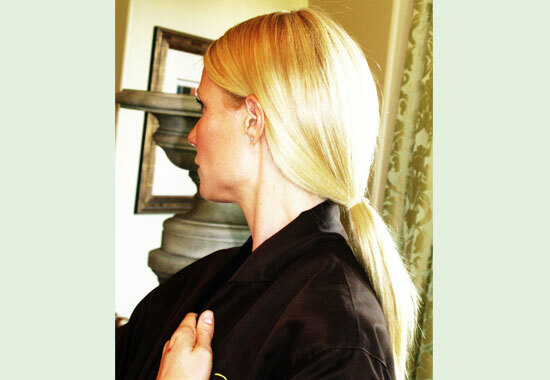 The straight, long ponytail mimics the straight, clean lines of the dress and cape. It’s more fun when you get ready with one of your best friends. First, I try these Anna Hu cuffs, as I was asked to represent her brand on the Red Carpet. They’re incredible. The one on the left is inspired by Van Gogh’s painting, Irises, and is made up of garnets, emeralds, sapphires and diamonds in the same colors as those of the painting. The orchid cuff on the right was inspired by Monet’s color palette and designed while listening to Chopin. Here’s Anna Hu herself, helping me with the cuff. Final touches as I leave. 3:45PM: In the car and on my way! Stephen Huvane, my publicist of 20 years, fixes my button right before I walk down the Red Carpet for pictures and interviews. I stop to chat with a member of our Armed Forces. I snapped this on my Blackberry so it’s a bit blurry, but there’s someone holding up Sandra Bullock’s train, and Sandra Bullock holding up soon-to-be Oscar winner, Octavia Spencer’s train. 6:30PM: Robert Downey Jr. and I get on stage to present the award for “Best Documentary Feature”. Robert helped write the funny mock documentary sketch for presenting the award to Undefeated. 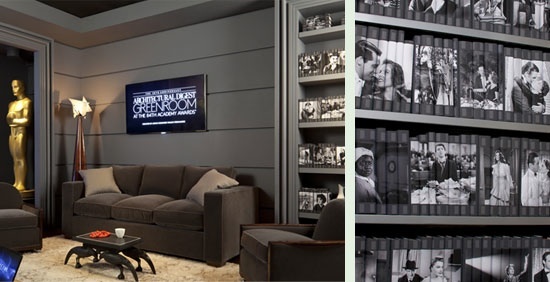 The green room, where all the presenters go right before getting on stage for a snack and refreshments, was designed by Architectural Digest this year. Juniper Books made stunning custom-made book covers based on classic cinema especially for this year’s event. 6:45PM: After presenting, I duck out to meet friends at the famous annual Vanity Fair Oscar Party. The event was at the Sunset Tower Hotel and I may have had the best french fries ever there. 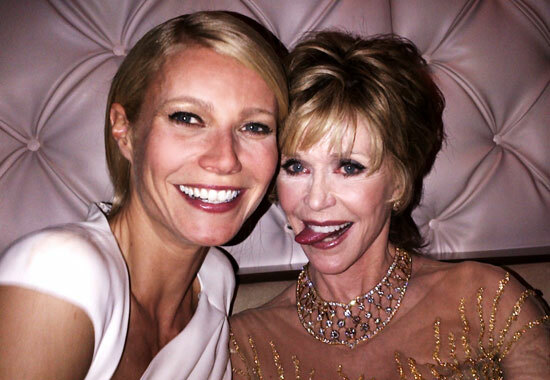 9:30PM: As ever, Jane Fonda is totally punk rock. This entry was posted in .Com Darling, Style Darling Daily and tagged Elizabeth Saltzman, goop, Gwyneth Paltrow, Oscars, red carpet, Tom Ford. Bookmark the permalink. ← Super Style Wishlist: Celebrate Style Darling’s 2nd Birthday With A Dress By Monique Lhuillier!